I know I shouldn't be surprised; but I am still in shock after reading a story printed on the Education Action Group website. Before I relate the story, I want you to understand exactly who EAG is, and their perspective. They are a foundation based on the desire to "shine a spotlight on the leftist agenda and activists and their mission to “fundamentally transform” the United States of America through the government education system." The perspective of EAG is very well-stated in this mission statement: When the government took upon itself the obligation of educating America’s youth, it undertook a serious responsibility that demanded results. In far too many communities across America, the government is woefully failing in that responsibility. Dismal test scores, out-of-control unsustainable spending, and the ardent defense of adults’ rights have all pushed the government education system to the brink of irrelevance. And worse yet, it’s all having a direct impact on our future ability to compete in the world. EAG believes the one-size-fits-all, assembly line government school system requires serious reform. It is their desire to see that 1) the needs of the students are put first; 2) the needs of adults are second; 3) Parents are empowered to seek the best education options for their children; and 4) State governments should enact reforms to give schools more control over their budgets and personnel decisions. OK, now that you know who EAG is and why they felt it was important to report this story, let's get to the facts of what happened to seventh-grader, Jordan Wooley, of Katy, Texas. Jordan took the brave step of appearing before a school board meeting to testify about her allegations that a teacher was attempting to force atheist indoctrination upon her classroom. “Today I was given an assignment in school that questioned my faith and told me that God was not real. Our teacher had started off saying that the assignment had been giving problems all day. We were asked to take a poll to say whether God is fact, opinion or a myth; and she told anyone who said fact or opinion was wrong and God was only a myth,” Wooley told board members. (See YouTube video of her presentation here). The teacher, “started telling kids they were completely wrong and that when kids argued we were told we would get in trouble. When I tried to argue, she told me to prove it, and I tried to reference things such as the Bible and stories I have read before from people who have died and went to heaven but came back and told their stories, and she told me both were just things people were doing to get attention." Here is where I can get personally involved. If you have been reading my blog from the beginning post in December, 2011, then you know my personal history with a young man named Ben Breedlove. Ben only lived for 18 years, but he left a legacy that will impact his generation for years to come. You see, Ben had a heavenly experience just weeks before his final death from Hypertrophic Cardiomyopathy. You can read my post about the night he died here, and click on the links to the 2-part video he left behind to attest to his faith and intimate knowledge of God and Heaven. 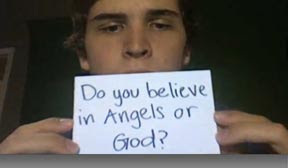 Although no one in his family knew he had recorded his experience in heaven, Ben knew what he was doing. Somehow, with his vast knowledge of the internet and social media, he planned for the videos to be released after his death. To this date, nearly 4 years later, it is impossible to know the exact number who have witnessed Ben's videos. Two years ago YouTube reported over 12 million people had received Ben's testimony of his heavenly experience, and you can read my post on his sister's 2013 book about the incredible influence Ben has had on people, both young and old, as he shared his hope that is Heaven. I can only imagine that millions more have heard his story. So, I can personally tell that 7th-grade teacher that Ben's experience in Heaven had nothing to do with getting attention. The attention didn't come until after he died. And it was real. Just as real as the God in whom Ben and Jordan Wooley have faith. But here is what really worries me.... Jordan explained [to the School Board] that she spoke with other students in the class who were marked down because they believe God is real, as well as [hearing] compromises proposed by students to avoid rejecting their faith. Did you get that? While some students were unwilling to say that God was a myth, others were already trying to figure out how to "compromise" their faith -- trying to figure out ways in which they didn't outright reject their faith, but would still enable them to pass the class. That is dangerous ground upon which to tread! But Jordan remained steadfast. “Another student asked the teacher if we could put what we believe in the paper, and she said we could … but you would fail the paper if you do,” Wooley told the board. “I had known before that our schools aren’t really supposed to teach us much about religion or question religion. When I asked my teacher about it she said it doesn’t have anything to do with religion because the problem is just saying there is no God.” But Jordan could not deny her faith. When texting her mother about the assignment, she said, "We had to deny God is real. Yeah, we had to say he was just a myth... I said he is real and she said that can’t be proven; I still put fact on my paper." 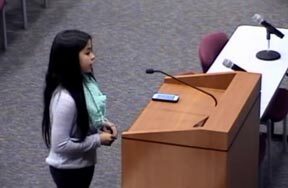 So this brave seventh-grade student appeared at the podium alone as she faced the Katy Independent School District Board. When asked how the exchange with the teacher made her feel, Jordan replied, "Like she was taking away my religion, what I believe is true." And that, sadly, is exactly what I fear that teacher, and the government education system, is trying to do. It wasn't enough to take God out of the classroom in the manner of prayer; now they want to destroy each individual child's choice to believe that He is real. While this may be an isolated incident in Texas, you better believe that it will soon be an issue in every classroom across this nation. As Texas education activist Alice Linahan told EAG News, the incident, and how district officials respond, could be an especially important indicator of things to come in the Lone Star state. “Will Texas students get a good job when they grow up because they can read well, write well, do math and know history?” Linahan questioned. “Or, will they get a good job, without strong academics, but an emotional attachment and classroom experience to save the world on a global level from a humanist viewpoint, without a belief in God?" What do you think? I think we all see the handwriting on the wall, and what the intentions are; but I pray that God will raise up a generation of Ben Breedloves and Jordan Wooleys to stand in the gap and declare His authenticity and His glory. We adults have not done a good job of it, but with the faith of a child, mountains can be moved.